Workers were watching as the Northern Wake Republican Club held its annual fundraiser at Newton Square this week to “Paint the town red” and elect conservative Republican candidates in the 2011 elections. North Carolina Speaker of the House, Thom Tillis, was their guest of honor, but for many of Wake’s working families, there has been nothing honorable about his speakership. Many Wake County residents are still seeing red from Thom Tillis’ blocking of unemployment benefits last spring, putting at risk the lives and families of 37,000 people so he could extort budget concessions from the Governor. They are seeing red from the 27 percent pay raise Tillis gave his staff while their own wages have remained flat for 30 years. Many here blame Tillis for enacting a state budget that is worsening our jobs crisis while undermining public education and environmental protection. They know Thom Tillis’ Voter ID bill and his assault on women’s health care are about partisan politics, not protecting the public interest. So when Thom Tillis came here to help elect more right-wing ideologues who will move Wake County backward not forward, we were there to object. 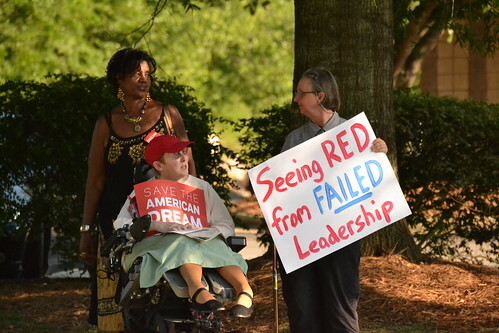 About two dozen Wake County workers and retirees lined the entrance to the event center and held signs aloft that read, “Workers are Watching”, “Save the American Dream”, “Jobs Not Cuts”, and “Raise $ for Teaching Fellows not Ideologues” – referring to North Carolina’s landmark scholarship program to encourage high school students to become teachers, funding for which was eliminated by Thom Tillis’ state budget. Many Wake County residents are disappointed in NC House Speaker Thom Tillis. Click here to see other pictures from our Workers are Watching Thom Tillis protest.